With fall and winter approaching, do you pack away your patio furniture and cover the grill, wishing there was a way to extend the summer? Rest assured, you are not alone. Homeowners are beginning to ask more from their landscapes. 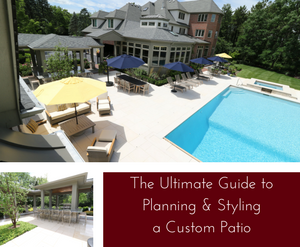 Adding elements that provide year-round purpose and beauty extend the use and value of an outdoor living space. One of the most popular requests is a natural stone outdoor kitchen design that compliments the home and pool area. One North Barrington homeowner recently completed a multi-year project that is the perfect example of a multi-season backyard oasis. With active teenagers, pet donkeys and a chicken coop this family was ready to embrace the outdoors 365 days a year. To achieve this, our landscape team partnered with other experts in the field, to add a natural stone outdoor kitchen design that includes a large pool patio, fire pit and hot tub. Working with their builder, Hellyer Custom Builders, in partnership with Pamela Self Landscape Design and The Barn Nursery Landscape Team, all their goals were achieved. First, the extensive home renovation was completed which included an extensive outdoor living space. Next, the outdoor kitchen area was designed adjacent to the back entrance of the home, making it easily accessible, even during the winter. It includes a pizza oven, bar area, sink, refrigerator, and 4 burner grill, making it a full service gourmet kitchen. Adjacent to the dining area and firepit, this cozy entertaining area is perfect for summertime margaritas or winter s’mores. The oval fire pit outlines the bar area placed in convenient, yet safe, proximity to the home. By including a gas hookup, this firepit is fast to start, easy to maintain and will keep toes warm throughout even the coldest months. Not interested in shoveling your way to the outdoor kitchen? This problem was addressed by creating a small bluestone patio adjacent to the kitchen that houses a modest gas grill. The pool is the highlight of this backyard oasis and includes elegant gas powered tiki torches which light up the night. Just steps from the home is a generous hot tub, which the family can enjoy summer and winter. Unique specimen evergreens and a natural stone water feature surround the hot tub, creating a nordic feel in the winter months. This family loves being outside, but no one wants to spend time maintaining fussy plants or replacing seasonal annuals. Instead, groups of low maintenance perennials were planted throughout the landscape that offer major impact from spring to fall. There is always something in bloom! Finally, an element of shade and protection is one the most important elements of a successful outdoor living space. The designer worked around existing mature trees which provide crucial shade during the hot summer months as well as a windbreak. Over the outdoor kitchen, a cedar pergola was built as a subtle shade element with decorative overhead lighting that adds evening ambiance. Your backyard is an extension of your home, why not equip it for year round use? By adding shade elements, thoughtful plantings and heat, fire, and water, you can make the investment in an outdoor living space pay off for your family every day of the year. We’d love to help you design a backyard pool and outdoor oasis your family will enjoy year-round. Contact one of our landscape designers today to get started. Want more landscape ideas? Read about another bluestone patio installation here.